Step by step guide for installing WB3.1 on MorphOS. I've got Amiga Forever rom's, how do I configure .uaerc to recognise and use the rom key file? pointing to your key file directory. I've downloaded the .hdf file and told e-uae to read it. After I started emulator I had the same screen you had, the AmigaDOS window. Now insert WB 3.1 install disk and after it loaded use CTRL+ALT+R for a soft reset. 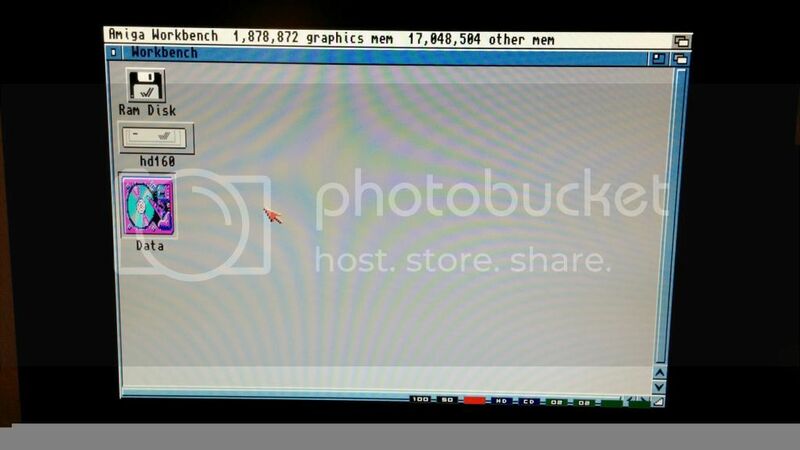 You will see a fast blue led blink (hard disk) and floppy will load workbench with ram icon, hard disk icon and floppy icon. Now you can start to install. Got E-UAE to recognize the key file and still my configuration boots to a useless AmigaDOS screen?! # joy<n> where n is lowlevel unit in amigaos target. In SDL target it's be the enumeration order. KS ROM should be fine, because you get that far (amigados shell). My guess is that UAE makes any HD/filesystem/hardfile bootable and it boots from it no matter if you have OS installed or not. When you have inserted the Install disk in df0: (ctrl-alt-f1), try to reset the emulator (ctrl-alt-r) and it should then boot from the inserted floppy image. And if that doesn't work, define install floppy image in .uaerc (floppy0=WB3.1-Install.adf). In any case it should boot from floppy first instead of hd, but if it isn't the case with uae, then try to hold both mousebuttons on boot to get into Amiga's early startup menu and select to boot from df0: there. Thank you guys, that worked a treat, I didn't see the reset procedure in there! One more question and I'm done, how do I install WHDLoad on my new desktop? Once you installed WB 3.1, download the latest version from http://whdload.de/ and then extract the files. Put the file you will find in C directory inside your WB 3.1 C directory and the files in S directory inside WB 3.1 directory and that's all. This operation is possible only when you load WB 3.1 and not from Ambient due to hdf file. So put the WHDLoad directory inside your "Data" directory and when you start WB 3.1 copy the above mentioned file froms Data to WB. Sorry, I'm a little unclear. If I cannot manipuate the file in Ambient then how do I access the file from within WB 3.1? Where is the data directory? I'm actually learning heaps here BTW and I hope that others can make use of this thread. Erase the # and when you will launch WB 3.1 you will have the System folder (with 3.1 installed), which is phisically inside the hardfile and the Data folder, inside sys:emulation/e-uae/HardDisks/. This folder is normally usable inside Ambient (is a real folder) while hdf file is a raw data file and you can't read inside with a double click (if you try you will receive a "No hexview for..." message). But when you launch e-uae this file is normally readable/writeable. If you insert any data inside your real folder (called Data in your config) when you will start WB 3.1 you will be able to read/copy/write in both folder, System and Data and this will allow you to exchange files from Data to System. Will give it a go tomorrow, thank you for your time Jambalah. When I edit my .uaerc and uncomment the #filesystem=rw,Data:sys:emulation/e-uae/HardDisks/Data line the system boots to the AmigaDOS screen and appears to compleately ignore my HDF with Workbench installed on it. Well, I assume you have 3.1 installed on hdf file then if you comment again the filesystem=rw,Data:sys:emulation/e-uae/HardDisks/Data line e-uae loads workbench flawless. Is this correct? If not and you have system installed correctly, check if the name of your hdf file specified in the uaerc settings coincides with the name of hdf file on your hard disk. If names are both correct try to install 3.1 again. You are correct in your assumptions, if I comment the #filesystem=rw,Data:sys:emulation/e-uae/HardDisks/Data line everything works fine. Do you think I should try to uncomment the line and re-install 3.1? I'd love to upgrade it to a Sonnet Encore @ 1.8ghz, until then my Mac Mini @ 1.5ghz with 32mb of vram will have to do. I'd guess there's nothing wrong or ignored actually. It just boots from Data partition instead of that Workbench HDF, but both probably are there. You can press both mousebuttons on startup and see if you have two bootable partitions and try to boot from other. But we also could try to change boot priorities of the drives. I haven't used any UAE that much that I'd know how it arranges the boot order, but I'd try first to move that hardfile line in .uaerc before the filesystem line. With a luck that's enough and UAE boots from correct partition this time. If that doesn't help, then with a quick look on e-uae docs there seems to be filesystem2 and hardfile2 options for .uaerc, which allow you to define boot priorities. jPV, that did it! Thank you very much for your assistance. There are a lot of files on the WHDLoad website, which one do I download? Just for a confirmation, the above method will result in whdload slaves to be run ONLY after the emulation has started and the user has entered to 3.1. environment and not via iGame plus whdload wrapper throught the Ambient. Correctly? Jpv was faster and more accurate! Thanks! Sonnet 1.8 is fast but believe me mdd 1.25 is a little faster..! This because L3 cache inside 1.25 (Sonnet hasn't) and a data bus faster (not so much: 133 mhz vs 166). Your G4 should be enough for MorphOS since this os needs no monster speed. Why don't you look for a sonnet 1.x too? There are some of them on ebay and are cheaper than a 1.8. And fast. Would it be more benificial fo me to download and install WHDLoad_usr.lha as opposed to WHDLoad_usr_small.lha? TBH, with a 1.25ghz PPC processor overclocked to 1.5ghz, my Mac Mini is actually pretty fast, and once you disable double buffering 32mb of vram is enough even for enhanced desktop @ 24 bit. It's just that my G4 desktop has some history behind it and I'd love to cram a fast processor and 9600 - 9800 GPU in there and enjoy it again, didn't know about the disabled cache on the Sonet, cheers Jambalah. Impressed with the help guys, thank you very much. The off-chip L3 cache is not disabled. It's not addressable by MPC744x CPUs so simply not there on CPU boards with these CPUs. usr archive just has more languages for docs. So from what I gather, I download a WHDLoad installed game (I assume possibly off the WHDLoad website itself?) and place it in my Data folder on my MorphOS host operating system. From there I'm a little unclear, do I launch the game from my UAE emulated WB 3.1 install or do I launch the game from my host MorphOS operating system? Not fussed either way, just a little unsure of what you're explaining.